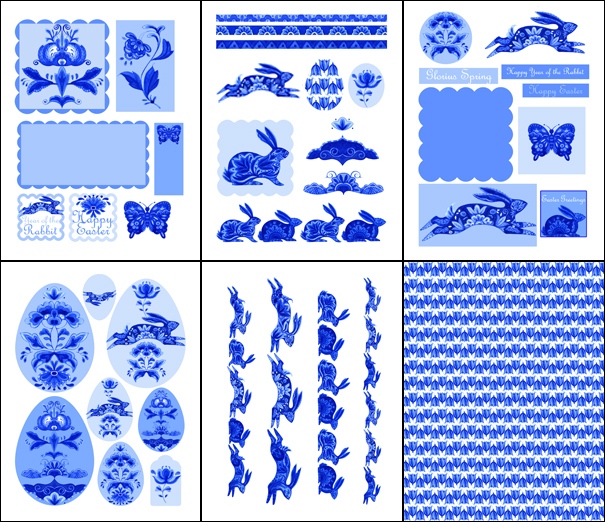 The Delft Rabbit combo has 30 pages. ​The wrap and topper set is to be used with a blank Decorate It! mug base. Mug and packets are included in the combo, but not in the single set. Enough elements for lots of cards! Mug and packets are included in the combo. The Decorate It! mugs are color-rimmed, but blank for your own decorations. Traditional Blue Delft pottery designs painted on an Anni Arts Rabbit.​ If you love blue and white porcelain you will love these printable crafts for Easter. 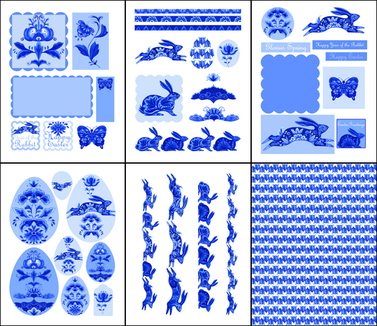 The Delft Rabbit card kit is crammed with toppers, borders, elements, egg shapes, tags and text sentiments featuring various Delft rabbits, blue flowers and butterflies. The square 6x6 postcard and envelope is included for Easter wishes and is a great card for anyone born in the Year of the Rabbit too. 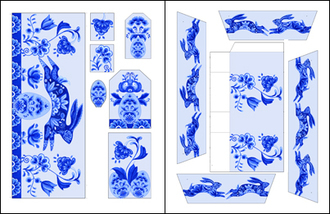 Luxury Delft Rabbit crafts are decoration projects for Easter and Spring. There is a handbag for little Easter egg choccies or sweets, wraps for cupcakes for Easter tea, or for muffins for Easter breakfast, or use as egg cups for big choc eggs. Plus small cups for hen-egg sized eggs, a small size for smaller candy eggs with tags. And the Anni Arts 3D Easter egg in three designs for smart Easter decorating. Just add spring flowers! A tulip background pattern is included for backings or wrapping of small gifts. as well as a bag topper. The wrap and topper set coordinates with the DIY blank mug which is included in the combo. An itty bitty bag is included too, which fits in the 3D mug of the Decorate It! blank set.